Description: Heading away from the camera, NS 6734 has just passed the Stroh Rd. grade crossing. Description: Ex-CR 6734 in perfect light. 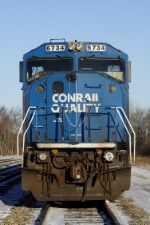 Description: A former Conrail unit was the trailing unit on this westbound stack train. Description: NS 174 rolls into Marion right around 1:30pm. This was the 2nd 174 this day. Description: NS train 174 is powered by a former CR SD60I, NS C40-8 and a GMTX GP38-2 as it rolls around the curve approaching the south end of the double track at Constitusion. Description: NS 124 sits in the siding at Hobbs waiting for L-89 to arrive. Description: An all EMD lashup on NS 124 waits in the siding for L-89 to arrive at Hobbs, IN. Description: NS 124 waits in the siding for L-89 before heading on west to Frankfort. Description: NS ex-CR SD60I #6734 approaches from the east with a double-stack train on her ex-CR Chicago Line while UP C45ACCTE #5520 continues to hold on the parallel CSX mainline at Pine Junction. Description: 205 westbound, with a blue leader. Description: Conrail and BNSF colors on 930. This train is one which often, though not always has foreign power. Description: NS 304 heads into the very late evening sun. Description: It is 8:15 as PRR 6734 (ex-CR 5605) heads up 20G on this Saturday morning to await the passage of two NS trains. Description: Lite power sitting at Lincoln Blvd in the west pocket of the Red Keys North Siding. Description: Ex Conrail SD60I on the NS Red Key North Siding in the West Pocket. Description: Lite Power on the North Siding in the West Pocket of the NS Red Key. Description: The couple in the Car Behind us Smile as they get their pictures taken with the PPL Coal Train. They seemed to think it funny that we were hanging out of the car to take pictures of this train while stuck in traffic. Description: NS 6720 leads a northbound with new hoppers. Im assuming this was a 537 but didnt have a working scanner to verify. Description: I wasnt able to get to the other side of the crossing for the shot but settled with this nose lit shot of a northbound empty coal drag. Description: The 536 creeps through South Williamsport with its 10mph speed restriction about to end near the MP 219 signal.